Unless otherwise noted, photos courtesy of Sara Zeigler. We recently teased you with a report of a possible farm animal invasion of Virginia-Highland. 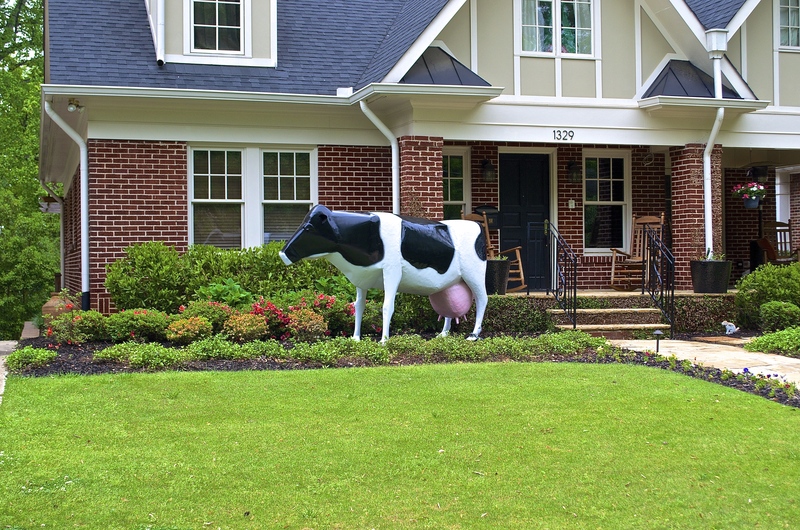 A herd of goats had been spotted on Hudson Dr., and a huge Holstein cow, desperately in need of milking, popped up in the front yard of a home on Lanier Blvd. What can we say? Sometimes we like to have a little fun here at The Voice. What journalistic integrity we do have, however, requires us to tell you the real story behind these interesting occurrences. Fortunately, the real stories are every bit as interesting as the one we made up – so here we go. Sara Zeigler, Phil Amon and their two children Joshua and Cate live on Hudson Drive. At the rear of their backyard was a large and expanding area of English ivy and other invasive plants. Seeking a way to reclaim that part of their yard without chemicals or heavy equipment, the Zeiglers turned to a ‘greener’ solution: goats. 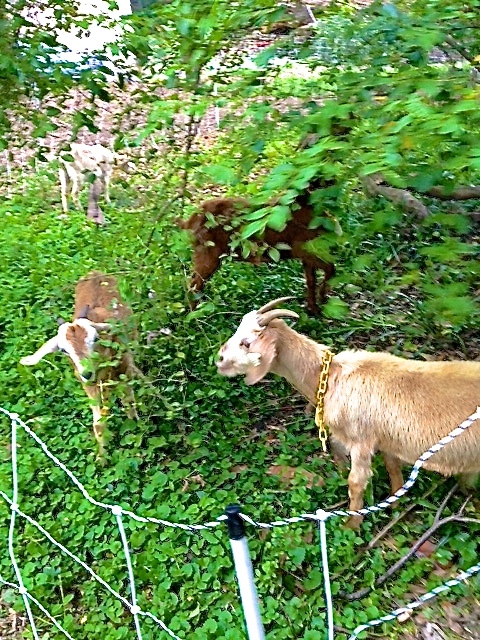 The goats arrive on Hudson Dr.
Goats thrive on poison ivy, poison oak, Kudzu, blackberries, nasty vines, and briers. The type of vegetation that ordinarily requires heavy machinery or toxic chemicals to manage…and they leave behind natural fertilizer. 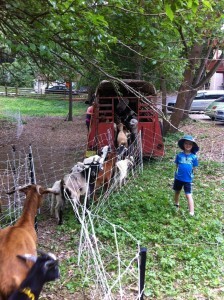 Renting goats for clearing is less expensive and less damaging to the landscape. Plus, it’s fun to watch! For about $200 a day, the company provides 30-40 goats and a herding dog that protects the goats from predators like coyotes. Electric netting is used to restrict the herd to the grazing area (more on that in a minute). The company claims the goats make minimal noise and the dog barks only if it detects a predator, so impact on neighbors is minimal. Prior to the goats’ arrival, the Zeiglers did a little outreach in the form of an email to their neighbors alerting them to what was going to happen. They shared pertinent info about using goats as an alternative to herbicides or machinery. 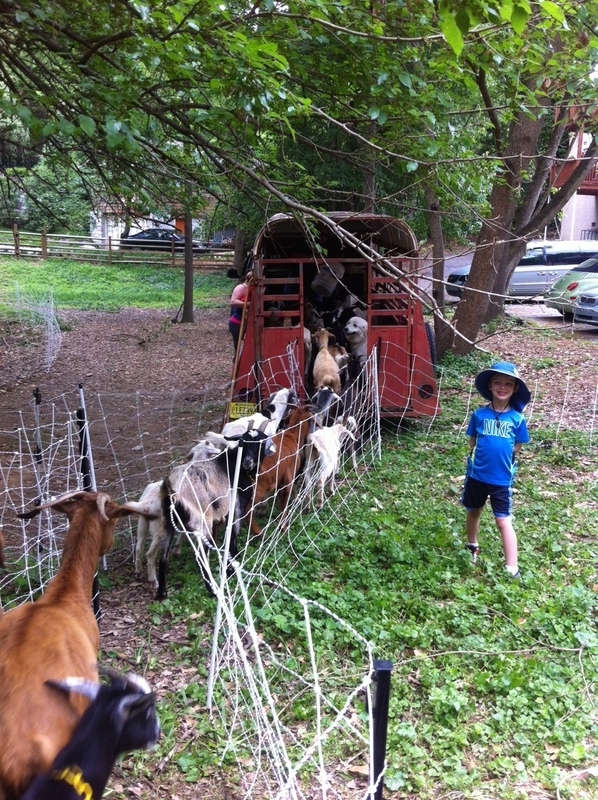 The goats arrived on Hudson Dr. on April 26 for what was estimated to be a 10-14 day stay. The Zeiglers were thrilled when the efficient herd completed its assignment in just 5 days. 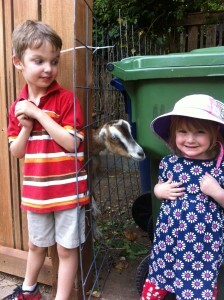 Sara says the goats were super-friendly and a big hit with both her kids and her neighbors. The goats’ stay on Hudson Dr. wasn’t without a little excitement, though. Two days into their stay, a large tree fell and took down the electric fencing. 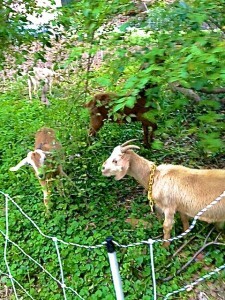 The goats escaped and began to search for new greens to eat. 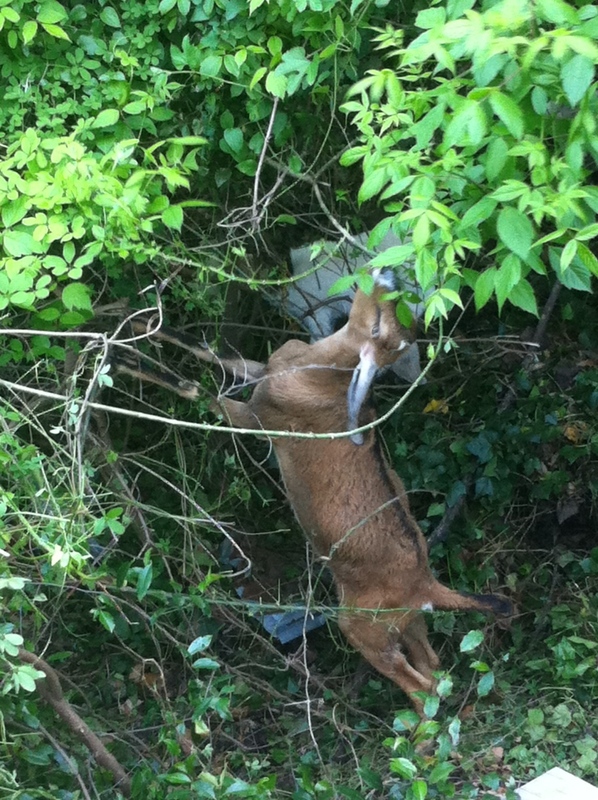 With the help of Zeigler’s neighbors, the goats were quickly recaptured. The next day, though, one of the more daring goats decided to climb on top of the fallen tree and chance leaping over the electric fence. It seems if one goats leads, the others follow and at 7:30 AM on a Saturday morning the herd of goats stampeded over the fence, up the driveway of a condo complex behind the Zeiglers’ home and ventured onto Rosedale Drive. 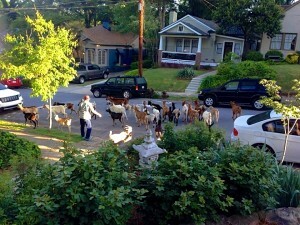 Residents woke to a herd of goats standing in their front yards eating their plants. Lucky for the neighborhood the goats can’t pass up fresh leaves and didn’t venture too far. 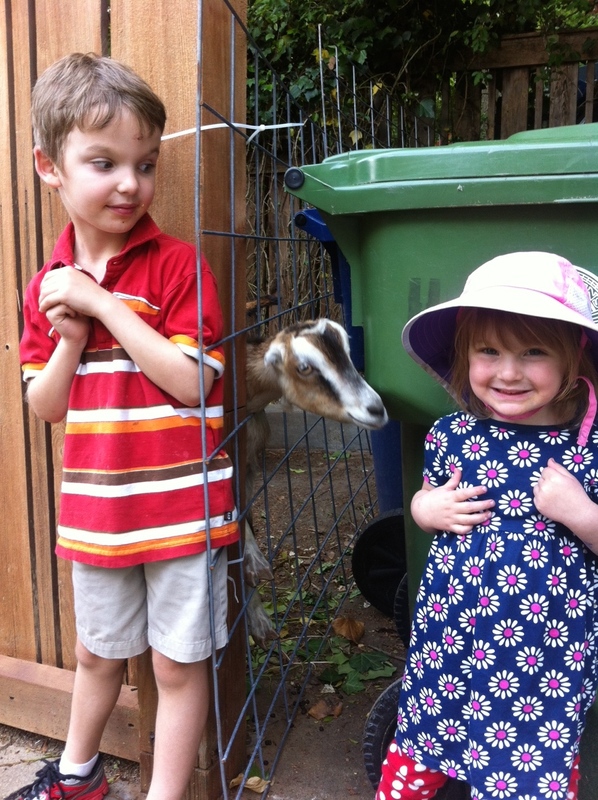 Cate’s not sure she’s ready for a goat kiss. Brother Joshua looks on. Overall, were the Zeiglers pleased with the results? 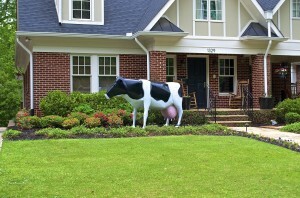 Coming soon: the real story of the big bovine on Lanier Blvd.